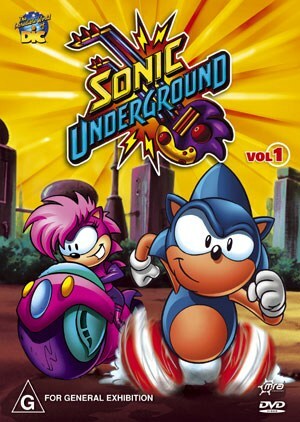 Sonic Underground covers the triplets, Sonic, Sonia and Manic in their battle against the evil Dr. Robotnik. Forming a band called Sonic Underground, the three hedgehogs lead the resistance movement against the robot army that Robotnik has created. Robotnik? Eggman? The villains of the Sonic Universe are all about the robots and this time Robotnik has created bounty hunters called Sleet and Dingo that certainly up the ante for the team. The stories on the disc cover the triplets and also their mother Aleena, of Mobius and Robotniks intentions to marry her at any cost, making himself king! This series is pure fun with nothing I would consider too heavy to be inappropriate for the kiddies. When Robotnik announces he plans to marry Queen Aleena, the shocked sonic siblings race to the rescue, unaware it's a trap. Argus, the former captain of the Queen's guard, arranges a secret meeting with her. But he is soon intercepted by Robotnik's bounty hunters, Sleet and Dingo, who have every intention of feeding the soldier to the roboticizer, the Sonic trio race to the rescue. Evading Sleet and Dingo, the hedgehogs find themselves in a town completely untainted by Robotnik's hand. Where the people are kind-hearted, and the food is free! Sounds like an ideal place, but there is more to Mobodoon than meets the eye, after using the power stone, the siblings discover that this is where they were born! Before further questions can be answered,Sleet and Dingo attack with an army of SWATBOTS, to preserve their past, the hedgehogs fight for Mobodoon's future..
Sonia gets down 'n' dirty with Sleet and Dingo, and to freshen up, she and her brothers journey to east Mobius. There, Sonia is reunited with an old friend, Mindy Latour, and her father. Mindy gives Sonia a locket. Unknown to Sonic's sister or Mindy though, is that the locket is a tracking device designed by Robotnik. Sonia finds out too late, and soon, Mindy's kingdom is swarming with similar wristwatch-style robots, all programmed to capture the hedgehogs! Can the siblings stomp out this bug problem? Good and easy viewing that almost all will enjoy.